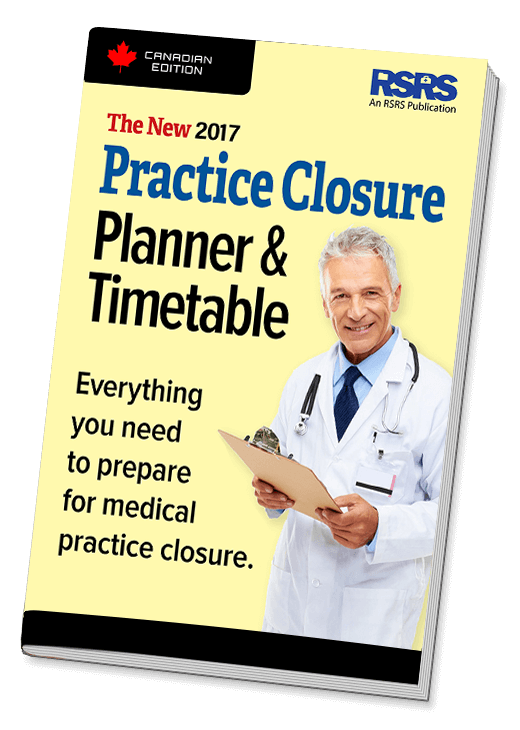 RSRS is pleased to announce the publication of a free book: The New 2017 Practice Closure Planner & Timetable, developed by RSRS to help retiring and relocating physicians follow all the steps necessary to complete a medical practice closure. This new book also contains an important tool that will help physicians alleviate the strain on staff and family when practice closure is sudden and unanticipated. To develop this book, RSRS called upon twenty-years of experience assisting well over 1,000 doctors with the various issues and tasks involved in practice closure. RSRS also gathered advice from outside experts. Of course, the suggested timelines and valuable information in the book are intended as general advice and are not a substitute for a personal consultation with an RSRS expert. When planning your practice closure, RSRS will take into account your particular objectives and circumstances. To get your own copy of this useful book for free, fill out the order form at this link or call 1‑888‑563‑3732, ext. 2 to speak to an RSRS representative who will take down your preferred mailing address and send you a paper copy of the book via Canada Post. Your RSRS representative can also offer helpful advice and assistance geared to the particular needs of your practice. Since 1997, RSRS has provided professional practice closure assistance services to Canadian physicians in the areas of patient notification, paper and electronic record storage and scanning, EMR extracts, medical record transfers and release of information, and secure shredding. RSRS also facilitates the transition of a practice from one physician to another. RSRS provides services in full compliance with the guidelines set forth by the provincial Colleges of Physicians & Surgeons, medical associations, as well as the Canadian Medical Protective Association (CMPA).